For Push-Lock hose. Takes "knuckle breaking" out of inserting Push-Lock hose barbs, couplers and plugs. This self-adjusting clamp holds the hose properly and firmly, allowing the fitting to be easily pressed in by light pressure on the handle. It also has a built-in Hose Cutter. It can be used as either portable or bench mounted. Cuts push-on style hose and inserts the fitting. 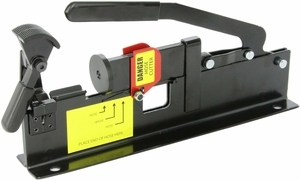 Built-in cutter slices through 1/4" - 3/4" ID reinforced push-on hose without fraying. Clamp hose into tool's vice and apply light pressure on handle to drive in the fitting. Tool has four 7/16" diameter mounting holes for bench mounting. Measures 13-1/2" length by 2-3/8" width by 7" height. Caution: Push-on fittings will properly grip push-on hose only when pushed all the way in, with the cut end of the hose completely concealed by the plastic cap. PLEASE NOTE: This tool does NOT work with standard hose barbs and ferrules, it ONLY works with Push-Lock Style Barbs and Push-Lock hose.